He should have been back 2 weeks ago. I'm expecting him middle of March which is a month late and if he doesn't come then I quit the game. K just got him to 5 stun guns away from gear 9. Ill be 10 by the weekend! Moved to the correct sub-forum. swgoh.gg profile: Pyrefly -- Check out my Galactic Power Tables and my TB Phase Info Tables !! The course is simple : R2-D2 , CLS , BB-8 , Rey (Jedi) , Thrawn ! As long as R2-D2 is not back and CLS also, we should not rely on the return of BB-8. Thrawn was the last one right? I'm expecting him middle of March which is a month late and if he doesn't come then I quit the game. Wasn't it palp and his mythic? Can we rotate out the Moderators? I'm 20 shards from unmasked being done. And 120 from masked being done. Give me two weeks please!! 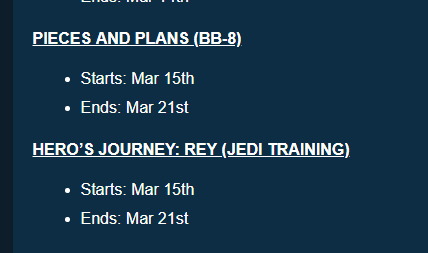 Actually we got bb8 at december 8th and then rey after that we get r2d2 on 21th dec then cls. So how is it likely to be r2 next . It should be bb8 first. I'm hoping tomorrow, with the bluray release of TLJ. Solid guess would be bb8 a second time before jtr comes back. Wasn't there already a BB8 mythic? BB8 has a mythic already. iirc it came even before R2's.. I am pretty sure they have anticipated Rey just in order to bring Han Solo movie (YAY another freaking Han) characters to the game on May. Mark on your calendars, Rey probably won't show up again until July. I'm still farming the Veterans just needed a few more weeks, but whatever I ain't falling for this shenanigans they are pulling.